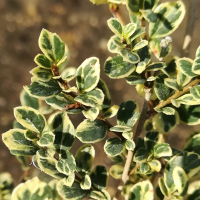 This is a very elegant shrub of relatively slow growth with large sprays of tiny leaves prettily margined with cream. A wonderful sight in early spring when the vanilla scented yellow flowers appear on the underside of the branches. 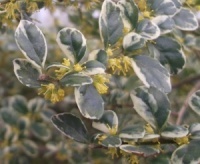 A beautiful plant for a sheltered site, it has serrated oval leaves and many clusters of yellow flowers in July. After a hot summer, it may produce small white berries.